Fresh corn is delicious and easy to prepare. 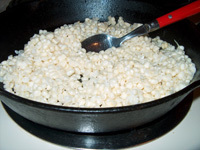 Boil it, grill it or try this yummy fresh skillet corn recipe. Husk corn and clean off the silks. Get a big bowl. Use a sharp knife, and cut corn from the cob into the bowl. You'll want to cut about half way deep into the corn. Then, turn the knife over to the non-cutting side and rub up and down the cob to get the rest of the pulp. Melt butter in large skillet. Pour in corn. Add enough water to make a gravy consistency. The amount of water you will need varies depending on the type of corn so slowly add water. Add the seasonings — sugar, salt, pepper. Cook on high for 5 minutes. Stir during this part of the recipe. Reduce heat to low and cover with lid. Simmer for about 20 minutes. Stir occasionally — about every 5 minutes. This recipe is a bit like creamed corn, but if you've only had creamed corn from a can, then this is WAY better. This article originally appeared at Suite 101.